Juce is offering high speed internet service to local areas, “…throughout Vancouver Island, including Greater Victoria, Nanaimo, Duncan, Powell River, Parksville, Comox/Courtenay etc.” Their packages claim to have unlimited bandwidth and an unthrottled connection. Does anyone have any first-hand experience with them? Shaw is now charging me roughly $70 per month just for Internet. No phone, no TV, just internet. I have always had good luck with Shaw but if I can cut my bill to $40/mth that wouldn’t hurt my feelings either. Plus, Shaw’s pricing is about to change in August of 2015 as well (source). Right now the package I get from Shaw is called “Internet 30”. You can see all their plans/stats here. Basically I get “Up to 30 Mbps down and 3 Mbps up, with 300 GB/mth bandwidth” with Shaw. Here’s my Speedtest result for those that care. Up until July 3rd, 2015 Juce is offering a similar package, “Up to 25 Mbps down and 2.5 Mbps up, with no bandwidth limits” for $40. *The incumbent cable carrier filed to CRTC to withdraw Cable 25 (25Mbps) plan to new customers on July 3rd, 2015. If approved, we will not be able to sell Cable 25 to new customers after July 3rd, 2015. Customers who subscribes to Cable 25 before July 3rd 2015 will be grandfathered and will keep $39.95/month price going forward and they will not be affected in anyway. In separate CRTC application, the incumbent cable carrier is seeking to set our cost for the new 30Mbps plan at 127% higher than existing 25Mbps plan. Therefore the new 30Mbps maybe priced much higher if this application is approved by CRTC. We recommend that customers wishing to purchase Cable 25 do so before July 3rd, 2015 to qualify for grandfathered status and pricing. I suspect if I read nothing brutally negative about Juce I might just go for it. Though be warned there are transfer fees ($22), modem fees, plan change fees, modem shipping fees, and perhaps installation fees if you all ready don’t have cable internet in your house. Also know that you may need your own wireless router separate from the modem for wireless service at your place. Shaw/Telus both have wireless modems… but not with Juce. For all the details, fees (nothing seems to be too alarming) and more see Juce’s FAQ section on their website. I’m switching over next week. Sick of Shaw jacking up their prices at several times the rate of inflation while paying their founder a $6 million annual pension. It’s interesting to read about how Shaw has tried to scuttle any competition by charging outrageous rates for renting their “last mile” infrastructure — evidently their shifting pricing plans have something to do with this, as they are trying to escape from unfavourable CRTC rulings. I’m with you Peter. Though I’m not quite clear on how any ISP competition can or will exist with Shaw (and/or Telus) owning the “pipes”. I feel like even if there was a mandate for Shaw to somehow share nicely (or price nicely) the “last mile” infrastructure — it would mysteriously never work out in a competitor’s favour. My HOPE with JUCE is that they differentiate their service by offering lowering prices for similar service (sticking to their niche), as they won’t have the massive overhead costs that Shaw does. My FEAR with JUCE is that when or if they start doing well for themselves Shaw will just jack them one way or another: price, bandwidth, legal threats, etc. It just looks to me to be extremely difficult for any competition to survive. Fingers crossed. Juce was our ISP until we experienced connectivity issues. When emailed about this problem, their response was that if we wanted 24 hour internet access we should be using one of their competitors. 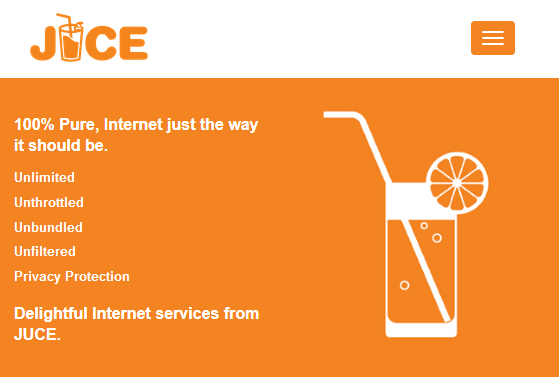 Other than the serious issue of being unreliable, Juce is a great choice for an ISP. Unfortunately those cheap prices come with unreliability. Hmmm… shame to hear about their customer support. When I purchase an Internet package from any company I expect it to work all the time. Thanks Brandon for taking a minute to let me (us) know. Anyone else have good/bad issues with JUCE?